Marcus Aurelius Carus Augustus was Roman Emperor from 282 to 283. During his short reign, Carus fought the Germanic tribes and Sarmatians along the Danube frontier with success. He brought stability in the empire and died in 283 aged 61. During his campaign against the Sassanid Empire, he sacked their capital Ctesiphon, but died shortly thereafter. Some sources claim that he died after being struck by lightning, others a wound sustained against the Persians. 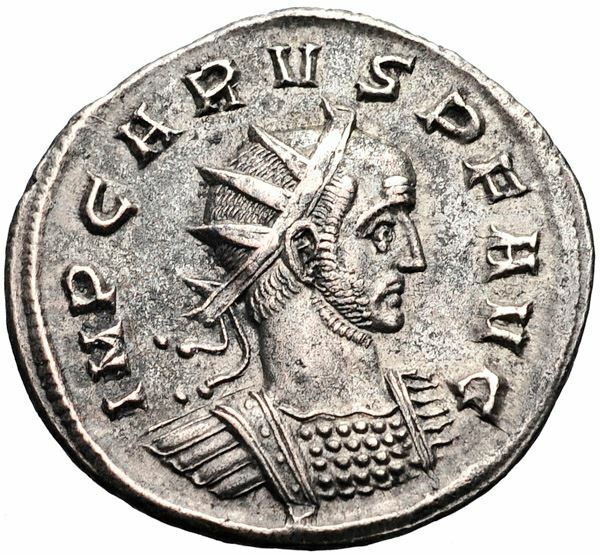 He was succeeded by his sons Carinus and Numerian, creating a dynasty which, though short-lived, granted further stability to a resurgent empire.